BKKBN, Indonesia’s national family planning board, is working to reinvigorate family planning services in Indonesia to increase the country’s modern contraceptive prevalence rate (mCPR), address unmet need, and ensure that women can choose from a variety of contraceptive methods. Critical to ensuring the success of this strategy is implementing a reliable, responsive supply chain that delivers quality contraceptives to service delivery points when and where they are needed. In support of this strategy, JSI Research & Training Institute, Inc. is addressing the supply chain component of the “MyChoice” project, funded by the Bill & Melinda Gates Foundation. The project is implementing both supply- and demand-side interventions designed to promote underutilized long-acting reversible contraceptives (LARCs). MyChoice is led by the Johns Hopkins Center for Communication Programs (CCP) in coordination with consortium partners, Jhpiego and JSI. JSI's logistics work complements the "MyChoice” behavior change campaign to improve product availability in 11 pilot districts through an implementation research approach. 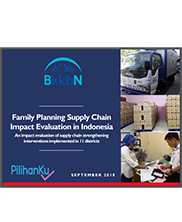 In 2015, JSI in partnership with BKKBN conducted an in-depth assessment to identify critical supply chain system gaps and designed a package of innovative supply chain interventions, focusing on building a robust inventory management system, improving data quality and use, and fostering continuous quality improvement through routine mentorship and on-the-job training. Trained over 700 health workers in inventory management best practices and logistics recording and reporting. Since 2015, there has been a 44% increase in the number of health facilities with adequate stock levels of contraceptives. Conducted skills building for 50 mentors who provided mentorship and on the job training to over 500 health facility providers. Facilities that receive regular visits have shown improved supply chain performance. Institutionalized supply chain IMPACT teams in 4 provinces and 11 districts resulting in improved collaboration amongst multiple levels of the supply chain. Using a data centric approach, the project has developed innovative tools for inventory management and supportive supervision that has led to improved data quality and use. With the introduction of simplified standard operating procedures and video job aids, stakeholders have been able to rapidly adopt these innovations. Building on this success, the government will begin scaling up the interventions in 2018, using their own resources, from 11 to more than 40 new districts. 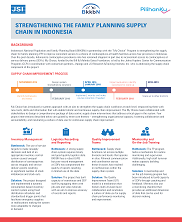 JSI also partners with the central government to make supply chain policy improvements including developing a robust quantification methodology to accurately determine contraceptive needs for the world’s fourth largest population.